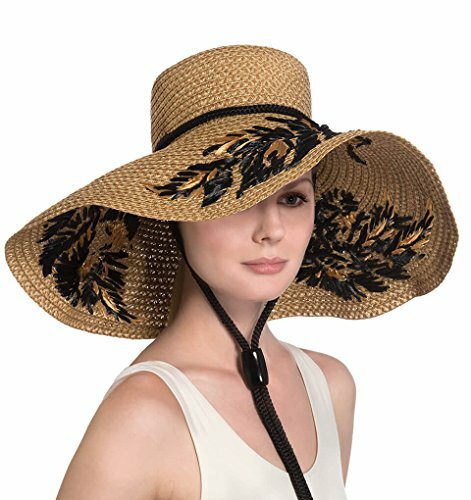 Dramatic sun hat of Squishee• with hand embroidered leaf motif of synthetic raffia. Rope chin strap secures the hat when it's windy and also allows it to hang down your back. Signature logo rivet is discretely placed at the back. Lightweight and packable. Blocks 95% UVA/UVB rays. Independent testing in accordance with AATCC (American Association of Textile Chemists and Colorists) test methods have determined this product's effectiveness for blocking ultraviolet radiation as well as UVA/UVB radiation. This product was awarded the highest rating of 50+ UPF by independent testing. To learn more about AATCC testing, go to www.aatcc.org. Due to the weave of this item, tiny pinhole areas may provide less than 50+ UPF. Rope chin strap secures the hat when it's windy and also allows it to hang down your back. Signature logo rivet is discretely placed at the back.